Procedure for drawing of samples and testing during Export – Reg. Procedure for drawing of samples and testing during Export – Reg. Procedure for drawing of samples and testing during Export – Reg. Sub: Procedure for drawing of samples and testing during Export- Reg. Attention of all officers posted in the CFSs for clearance of the export cargo is invited to the Board Circular Nos. 34/95, dated 06.04.1995; 1/2011-Customs, dated 04.01.2011; along with the S.O. No. 41/2007, dated 10.10.2007; 42 /2011, dated 13.05.2011; and Standing Order No. 17/2009, dated 21.04.2009; as amended vide Standing Orders No. 10/2010, dated 11.02.2011; 06/2011, dated 19.01.2011; and 12/2014, dated 17.12.2014 in respect of ‘procedure for drawing of samples and testing’. Recently, many instances have been noticed, wherein above instructions were not followed. 2. It has been noticed that, in many cases, while forwarding the RSS for testing, the queries/objective in the test memo have not been specifically stated. There are instances where, in cases of suspected overvaluation of export consignments, the “Representative Sealed Samples”were sent for determination of composition only. 3. In addition to the procedure laid down in the above said Circulars and Standing Orders, it has been decided that wherever the Docks Officer is of view that the samples are required to be drawn for testing, to check compliance of policy conditions or to establish identity of the goods, ascertain composition & valuation of the goods or any other specific purpose, the procedure as prescribed in this standing order should be followed. (i) The EO/PO posted in the docks, himself, under the supervision of A.O./Supdt. (P), shall draw the representative samples sought, in duplicate, in the presence of the Customs Broker(CB)/ exporter / duly authorized representative of the exporter. (iii) The sample should be sealed by the sepoy/scale man, in the presence of EO/PO and authorized representative of the CB/exporter. The cover of sealed sample shall be signed by EO/PO and the authorized representative of the Customs Broker /exporter, which should also be countersigned by the concerned AO/Supdt(P)(Docks). (iv) The “Test Memo”shall be prepared by the EO/PO. The EO/PO shall incorporate all the relevant queries/purpose, for which the expert opinion is being sought. This test memo shall be countersigned by the AO/Supdt(P)(Docks). The technical literature, if any, available with the consignment, should also be attached along with the test memo. (v) The Test Memo, duly signed by the EO/PO and concerned AO/Supdt. (P)(Docks) shall also be endorsed with the details of the seal number, with which the samples were sealed. After completing the process of sealing of samples and preparing the test memo, the concerned EO/PO/EA/TA (Docks) shall enter the details of the sample and Test Memo in the “CFS Sample Test register”, which is required to be maintained in every Container Freight Station. (vi) It is observed that the officers, working in the export docks, are not making entry in the ICES 1.5 system in respect of drawn samples. 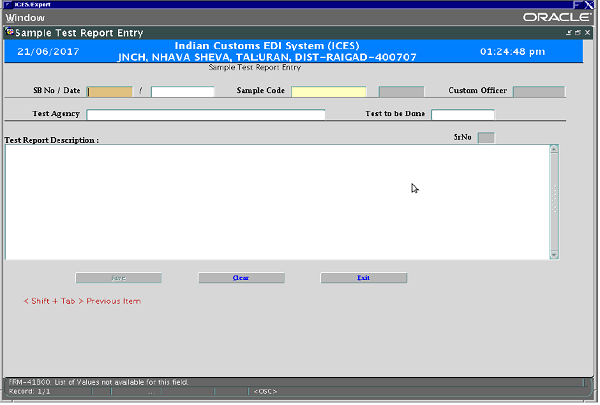 It is mandatory for the EO/PO to make entry of the drawn sample in the prescribed menu under ICES1.5 system which is given above. He shall also ensure proper storage of the samples, till they are deposited with the “Central Sample Cell”. (vii) The sealed samples along with the Test Memo shall be handed over to the Central Sampling Cell (CSC) for onward submission to the concerned laboratory. (viii) The sealed samples would be handled only by the Customs staff and shall be transported / forwarded by the designated Customs staff, duly authorized in this regard. In any case, the sealed samples and test memos shall not be handed over to the representative of Customs Broker/exporter. (ix) The concerned AO/Supdt. 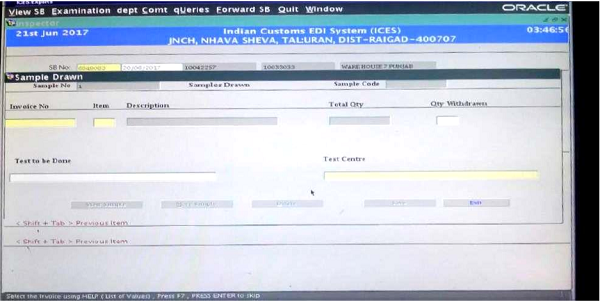 (P) shall allow the Let Export Order only after ensuring that the concerned EO/PO has entered the details of sample properly in the prescribed menu of ICES1.5 system given above. (x) After entering the details of the samples in the “Sample Test Register”, maintained at each CFS and in EDI Module, both samples shall be handed over to the Central Sampling Cell (CSC) officer deputed for collection and transportation of samples from various CFSs and an acknowledgement of receipt of the samples shall be taken from the collection officer in the “CFS Sample Register”. (xi) All the samples collected by the team will be collated and entered in the Register (in the prescribed proforma) maintained by “Central Sample Cell” date wise. One set of sealed samples should be stored in the Central sample cell. The other set shall be forwarded for the test. Care should be taken to keep the sealed samples secure and intact. (xii) Only the samples, which need to be tested for the Customs purposes, including the samples to be tested by textile committee, are to be handled by the Central Sample Cell. The sample collection and storage for the purposes of the other agencies (Drug Controller, PHO etc.) shall continue to be handled by the respective agencies only. Where the NOC is received from the Allied Agencies, the EO/PO at export Docks / CFS shall make an entry in the departmental comment, giving the full details of such NOC viz. reference no., date, issuing authority etc. (xiii) In cases, where the Customs Lab is unable to test any one of the queries, sought in the test memo, the sample should be sent to the designated/accredited Labs where all the tests can be handled to avoid delay. These decisions should be taken by the Supdt. (P)in charge of Central Sample Cell, on the basis of the past database or in consultation with the concerned Asstt./Dy. Commissioner of Customs(Docks). NO PRIMA FACIE CASE OF MIS-DECLARATION ETC. 6. There are instances, when samples are drawn by the proper officer to obtain confirmation of goods declared in the shipping bill, as prescribed in CBEC Circular No. 34/95 dt. 06.04.1995 and &1/2011-Customs, dated 04.01.2011, but prima facie, by visual examination, the concerned docks officer has no reasonable basis to primafacie allege deliberate over-valuation, deliberate misclassification, deliberate mis-declaration etc. It is clarified that, as per the prevailing practice, there is no need to take any bond or BG, before allowing clearance of such goods for export, after drawl of samples. PRIMA FACIE CASE OF MIS-DECLARATION ETC. 7. However, there may be cases, where the docks officers, prima facie, by visual inspection, suspects or has evidence of an case of deliberate over-valuation, deliberate misclassification, deliberate mis- declaration etc. Such cases need to be referred to SIIB (X) for investigation. In such cases, SIIB(X) to collect samples, if need be within one day of receipt of such information. 7.1 In such situation, if the goods are seized under Section 110 of Customs Act, 1962, goods may be provisionally released subject to compliance of Section 110A of the Act. 7.2 However, if the goods are not seized under Section 110 of the Act, appropriate bond/BG, as decided by the adjudicating authority, need to be taken by the export docks officer before allowing clearance of export goods in terms of provisions of Section 18 Customs Act, 1962. 8. Difficulty, if any, may be brought to the notice of Deputy / Assistant Commissioner in charge of Appraising Main (Export) through email / phones (email address: apmainexp@jawaharcustoms.gov.in, Phone No : 022-27244959,). 9. This, issues with approval of the Chief Commissioner of Customs, Mumbai Zone-II, JNCH. Action to be taken in terms of decisions taken in this Public Notice should be considered as standing order for the purpose of officers and staff.